Do you like the arrangements that you see in the shop’s displays? Do the flowers in the pictures look fresh or are the petal edges brown? Are the pictures dated or are they following the current trends? Is the designer willing to work with you or are they telling you that your idea won’t work? Make sure you speak to the florist that will do your arrangements. Do you feel comfortable with your florist? Is your florist paying attention to you while you’re talking and does he/she seem interested? Six months before your wedding is a good time to start your search. 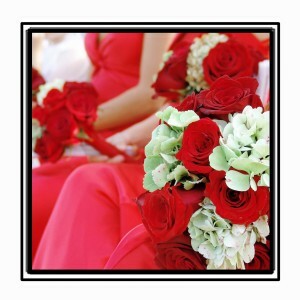 Book your florist approximately four months before your wedding date. You need to have your reception and ceremony sites picked out before you can hire a florist because you’ll need to know how many arrangements you’ll need and that the colors you pick don’t clash with the colors of your venue. You’ll also need to know what color your bridesmaids’ dresses are. If you are supplying the containers for arrangements, bring those too. Bring quotes you’ve gotten from other florists. Bring a list of all the flowers and arrangements you need and who they are for, so that the florist can label corsages, boutonnieres and bouquets, with names or titles. Example: on a bouquet a stapled piece of paper reads “maid of honor”. This way everyone gets the right flowers. 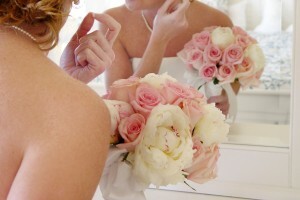 When viewing photos of past work, ask if the flowers where arranged by the same person that is doing your arrangements. After giving your florist your ideas, ask for their opinion or ideas. You don’t have to take their advice but at least take the time to listen. You never know, you might like their ideas better then your own. Do they have rental supplies? Do they need a map for the different delivery locations? Can you change your order if you have another idea? What’s the cut off date for new ideas? What times will the flowers be delivered to each location? This question can be asked 1 month before your wedding. Will the florist transport ceremony decorations to the reception location? Is there a fee? Can they make a sample of your bouquet and centerpiece? Some florists will, some won’t. Will they write you up an itemized quote? Some won’t in fear that you will bring it to other florists for a better deal. Are the flowers you’ve chosen in season? What flowers are in season for your date? You’re on a tight budget, can the florist work with a mixture of silk and fresh flowers? Is the florist familiar with your reception and ceremony locations? One month before your wedding date, call the florist and ask them if they can get the type and color of flower you wanted? If your wedding date is around the time of a flower giving holiday (mother’s day, valentine’s,etc) you’re going to pay more for your flowers. The florist will also be very busy during this time and you can’t expect to be the centre of attention. Meet and speak to the person that will be making your flower arrangements. The contact person’s name, address and phone number for every delivery location. An itemized list and description of every floral arrangement, the number required, color of ribbons and other decorative accents. The service they will provide. i.e. setup and delivery to each location and what this entails. The total cost, your deposit and the amount still owing and the date for the last payment.